Ruskington Rovers beat last year’s finalists Coningsby 4-2 in the Mason Bros Lincolnshire Junior Cup to book their place in round four. They are the only Boston League side left in the competition. Workforce Unlimited Premier Division leaders Spilsby Town lost 4-3 to Lincs League Wyberton, although goals from Josh Wood, Liam Papworth and Michael Twigg gave them hope. Meanwhile, Benington went down 2-1 at home to Horncastle Town, another Lincs League side. In the Premier Division, Railway Athletic travelled to Fulbeck United and, in a very close game, came away with a 1-0 victory. Kirton Town found the net five times as they had an excellent home victory against Wyberton. The only other game in the top flight saw Skegness Town Reserves entertain Old Leake in a goalless draw. In Division One, leaders Fishtoft travelled to bottom team Swineshead Institute Reserves, winning 7-1. Woodhall Spa United won their derby against Horncastle Town Reserves 3-2 and Boston College had a 4-1 away win at Old Doningtonians, goals coming from Reece Young (two), Nathan Rivett and Piotr Puchala. Fosdyke took all the points thanks to Alex Cammack, Callum Karpyzyn and Matty Bray in a 3-2 home victory against Freiston. Park United got back to winning ways when they beat Billinghay Athletic 5-2, Tom Limb, Jimmy Harris (two) and Alex Limb (two) completing the scoring. 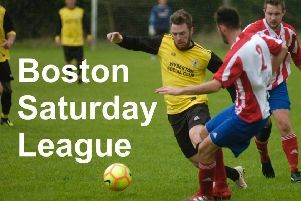 Division Two leaders Eagle United beat FC Wrangle 3-1, Tom Bates (two) and Alex Earle on target. Skegness Town A moved to within a point of third-place Boston Athletic when they beat them 4-3, Skegness’s goals coming from Morgan Coombes, Josh Whittam (two) and Dan Starkey. Spalding Harriers put six past Caythorpe, Karol Narojczyk with a hat-trick and Rafel Marczewski (two) and Daniel Goodard on target. Division Thee leaders Bull Athletic found themselves 3-0 down, but came back to win 4-3 against Wyberton A.
Boston College Reserves put 14 past Fosdyke Reserves in a 14-2 success thanks to goals from Deividas Urbsys (five), Aarron Smith (three), Michael Fleming (three), Alan Baxter, Matthew Scott and Pedro Pereiro. Digby and Park United Reserves shared a 3-3 scoreline while, at Mareham in the derby against Woodhall Reserves, neither team could find the net.